New Housing arrives at Queen of Peace. If you have been in the Youth Center in the last few weeks you may have noticed some new additions. 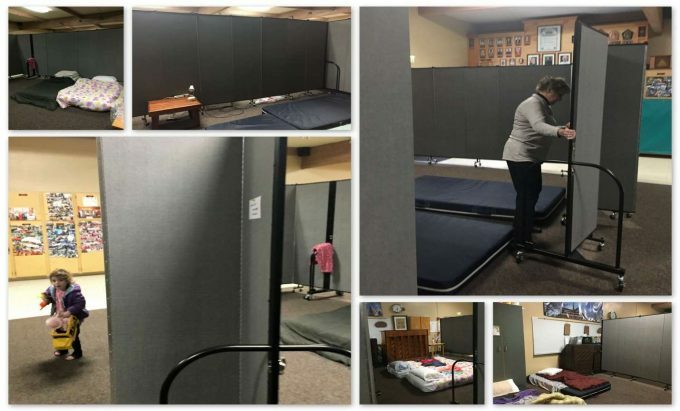 In December we were able to purchase five new “Screenflex” portable divider panels for use when the Salem Interfaith Hospitality Network (SIHN) families are guests at our church. Prior to purchasing the new panels, we were using old office dividers that were either missing their base supports or utilized homemade ones that didn’t offer the same support as the commercial units. Queen of Peace became a hosting church for SIHN in 1999 and had been using the old dividers for the last 18 years. We tried tying, taping and finally attempted to wire the dividers together to keep them upright and stable. 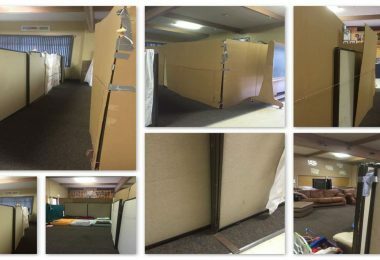 To provide additional privacy we also tried using large sheets of cardboard tied or taped to the panels. Overall, it was a pretty dismal sight for us and for our guests, who have never complained and often commented that they were just grateful to be out of their car or not under a tent or bridge. We had originally set out to try to find some new base units –but alas, they were no longer being made and we could not locate used ones, but with the wondrous hand of God involved, we did locate a local gentleman who had previously sold room dividers. He spent hours with us at the church and online trying to find replacements. Ultimately he suggested we look into purchasing the “Screenflex” partitions. We went online to view the panels and immediately realized that not only would these panels work marvelously with the SIHN families but would be very versatile with other parish ministries and activities. One of our parishioners contacted St. Vincent de Paul and they awarded us a grant to assist in helping the homeless in the Salem area by purchasing the units. Two parishioners involved in the SIHN program at Queen of Peace donated the remaining funds and we ordered the five panels, each 6 feet -8 inches high and 24 feet long. Each panel is sound absorbing, self-leveling with full-length hinges on each panel which allows them to be shaped into squares, circles, and various other configurations. Our panels arrived on a snowy December 12, 2016. They had their grand debut in the SIHN ministry on January 8, 2017 (AFTER photo). We are extremely pleased with these new additions to our parish and wanted to share this success story with you and to again thank donors and supporters who made them possible.